Some of us may lament that we are not fluent in speaking. By training and practice, we all can improve our speaking ability. Even if it’s true that everyone can’t become an eloquent speaker, there’s one aspect of speaking well that we all can develop: learning when not to speak. And this is no small ability – even the fluent sometimes lack it. People whose words flow easily may well be especially vulnerable to the temptation of speaking too much, thereby spilling confidences or courting controversies. The media regularly reports motormouths whose loose speaking earns them censure, even condemnation. 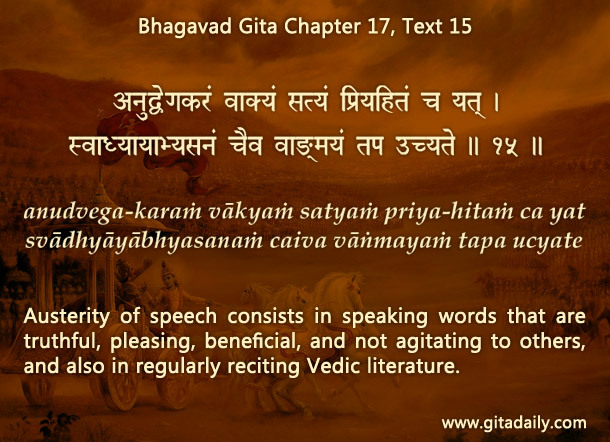 Pertinently, the Bhagavad-gita (17.15) outlines austerity of speech: it declares that we should speak in a way that is non-agitating, pleasing, truthful and beneficial. This implies that we shouldn’t speak in agitating, hurting, untruthful and harmful ways. Life periodically presents us with temptations to speak in these negative ways by, say, backbiting, taunting or gossiping. Amidst such situations, the ability to zip our lips can keep us out of trouble. Moreover, when people see that we keep others’ confidences and avoid slurring their reputation, they will infer that we will do the same for them too. Restraint in speech may not earn applauses, as might fluent speech. But it can earn something much more precious and elusive: trust. And hearteningly, we all can develop such restraint. The same Gita verse urges us to recite scripture regularly. By such recitation, we come in contact with the all-pure, all-potent supreme, Krishna. And by that divine contact, we get the purity and potency to restrain ourselves. Rather than lamenting about the fluency we don’t have, we can instead strive to gain the restraint we can have. By such positive proactive purposefulness, we all can learn to tap the power of our speech more effectively. In general,people can’t speak well,and never they know when not to speak,as media always incites them to react.